There are a lot of great things about Australia that are even better in summer: sun, sand, surf… you know, the whole 'sunburnt country' thing. Alas for you and your pet, it's also the season for fleas. Products such as Revolution® can be used to treat, control and prevent flea infestations, as well as control flea allergy dermatitis. It is also important to remember that Flea preventatives should be used all-year round. 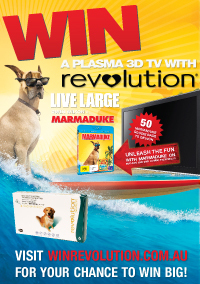 This summer Revolution® and 20th Century Fox are giving you the chance to win hundreds of prizes, including a Plasma 3D Television, with the release of Marmaduke on DVD and Blue-ray Combo pack on 15th December 2010! There are also 50 exciting runner up prizes of Marmaduke Doggy Bags which include a Marmaduke toy, Marmaduke dog bowl and a Marmaduke DVD. Click here for details on how to enter the competition.